I don't remember where I first heard or read the line, "Everyone has a story to tell", yet it's echoed in this book; it's the first sentence of the Introduction. Authors Jessie Coleman and Paul Peditto set about showing us how to harness a story from a particular part of one's life. How to discern the dramatic from the everyday. I liked this piece of advice: "Look for the hot spots of your life, the moments of the greatest change, greatest lessons, and sometimes the greatest loss." But what if your life is one big, fat drama? How do you choose which part to hone in to use as a storyline for a movie? We're given Story Ideas to Get You Started, which point you in a few directions, some of which may or may not resonate. "Find something universal that will resonate with total strangers" made sense to me. You can take one aspect and turn it into a "story", and the areas given to look at are very helpful. Such as, Siblings, School, Parents, Vacations, etc. I bet you can come up with a movie for each of these aspects. The movie examples given in this book tie in with their suggestions and clicked with me. The book is easy to read and I found it rather inspirational in that I thought of a few instances in my own life I could work around. Try the logline exercise and you'll see that you do have a story to tell. Once you get this done, things start rolling and falling into place. The two worksheets help to define one's story and to identify the beginning, the middle and the end. Their other worksheets really make it easy to put together characters, and they come up with all sorts of possible character aspects to consider. I also found the examples of the difference between writing a book and a screenplay really useful to know and bear in mind when setting out. 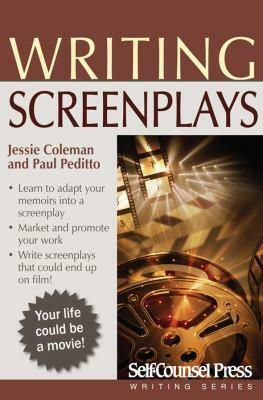 The bonus in this book is that a full screenplay is given which is enormously helpful in "seeing" how it's done. I liked that this book is short and sweet and to the point yet full of helpful and inspiring points, and I also liked the bullet-point scene description approach. Some books are just too wordy and confusing; this one is not. There are lots of online addresses for help and advice for when you need it. Conclusion - An excellently put together book. Succinct with all pertinent points tackled and explained. One thing I didn't see was how to bind your script. I've always heard about how important it was to bind your script correctly. Website design and © Adrienne Petterson 2003-2014.